Loose powder shadows offering intense colour, finely milled for glide-on application and satiny feel. Packaging: The pigments come in tiny plastic bottles with a black screw on cap. They're definitely smaller than NYX Cosmetic's new Chrome pigments, but they're slightly taller. (See my reviews for Fuchsia, and Penny). These are super easy to store. When you un-screw the cap, there's a small opening for the pigment to prevent fallout, but still it can happen. A tiny brush or Q-tip can fit into the packaging. Product: These pigments are smooth and satiny, and really do glide on nicely. They're all pretty shimmery. They're well pigmented, but sometimes using a brighter eyeshadow as a base can really make the colours pop. Sky Pink: is a shimmery, rosy pink. Orange Zest: is a bright orange shade. Yellow Pearl: is a gorgeous bright yellow. Jade Pearl: is a bright jade green shade. Purple: is a medium purple shade. Ocean Blue: is a medium blue / oceany shade. Hence the name. Grass Pearl: is a shimmery, muted chartreuse green. Rust: is a bright, dark copper / gold shade. Final Thoughts: These pigments are well-pigmented, and very reasonably priced. There are 30 different shades to choose from, so theres a good variety. They also have new chrome eyeshadows are bigger, and come in 60 different shades for $7.99 each. 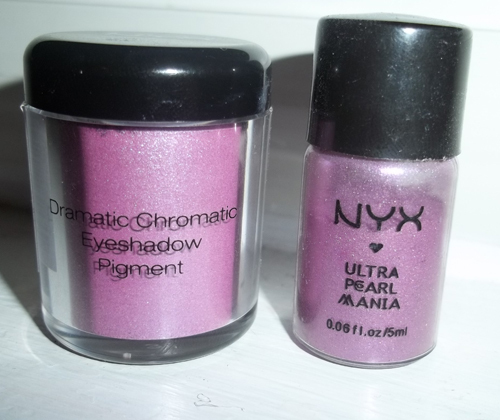 NYX Chrome Eyeshadow VS NYX Loose Pearl Purple Eyeshadow in size.